March MPRE scores are now available in NCBE Account File Cabinets. 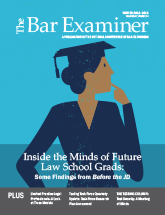 Inside the Minds of Future Law School Grads, Limited Legal Practice Professionals, Test Security, Testing Task Force Quarterly Update, and more. Visit the Testing Task Force website for the latest Task Force news, recent blog posts, and more. NCBE conducts character and fitness investigations on behalf of participating jurisdictions. Examination and admission statistics, national data for the MBE and the MPRE, and more. NCBE offers score services for the MPRE, the MBE, and the UBE. Visit the NCBE Study Aids Store to purchase study aids on NCBE's new eLearning Platform. Select a jurisdiction from the drop-down menu for a summary of bar admission information specific to that jurisdiction and contact information for its bar admission agency. Comprehensive information on bar admission requirements in all U.S. jurisdictions, including a directory of state bar admission agencies. March 2019 Exam: March MPRE scores are now available in NCBE Account File Cabinets. Developed and scored by NCBE, the MPRE is a two-hour, 60-question multiple-choice examination covering established standards related to a lawyer's professional conduct. The MPRE is administered by NCBE and required for admission by most jurisdictions. Coordinated by NCBE, the UBE is composed of the MEE, MPT, and MBE and results in a portable score that can be transferred to other UBE jurisdictions. The UBE is administered and graded by user jurisdictions. Developed and scored by NCBE, the MBE is a six-hour, 200-question multiple-choice examination covering seven substantive areas of law. The MBE is administered by user jurisdictions as part of the bar examination. Developed by NCBE, the MEE consists of six 30-minute essay questions covering up to 12 areas of substantive law. The particular areas covered vary from exam to exam. The MEE is administered and graded by user jurisdictions as part of the bar examination. Developed by NCBE, the MPT consists of two 90-minute tasks designed to test fundamental lawyering skills in a realistic situation. It is not a test of substantive knowledge. The MPT is administered and graded by user jurisdictions as part of the bar examination.